Subtropical climates are often characterized by warm to hot summers and cool to mild winters with infrequent frost. Most subtropical climates fall into two basic types: humid subtropical, where rainfall is often concentrated in the warmest months (for example Brisbane, Queensland or Jacksonville, Florida), and dry summer climate or ( Mediterranean), where seasonal rainfall is concentrated in the cooler months (for example Naples, Italy or Los Angeles, California). The Mediterranean climate regime resembles the climate of the lands in the Mediterranean Basin, parts of coastal southwestern North America(including western parts of the Pacific northwest), parts of Western and South Australia, in southwestern South Africa and in parts of central Chile. The climate is characterized by hot dry summers and cooler winters with rainfall. 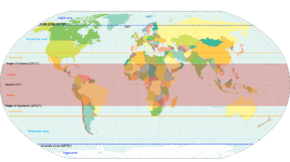 In Europe, the northernmost mediterranean climates are found along the French Riviera, located at 43° latitude. On the immediate Atlantic coastline, the mediterranean boundary goes between Porto and Vigo at around 41° latitude. Parts of southwestern Australia around Perth have a Mediterranean climate as does areas around coastal South Africa. ^ Ron Kahana; Baruch Ziv; Yehouda Enzel & Uri Dayan (2002). "Synoptic Climatology of Major Floods in the Negev Desert, Israel" (PDF). International Journal of Climatology. 22 (7): 869. Bibcode: 2002IJCli..22..867K. doi: 10.1002/joc.766. Archived from the original (PDF) on 19 July 2011. ^ Wilson Popenoe (1920). "Manual of Tropical and Subtropical Fruits: Excluding the Banana, Coconut, Pineapple, Citrus Fruits, Olive, and Fig". Nature. 108 (2715): 7. Bibcode: 1921Natur.108Q.334.. doi: 10.1038/108334a0. hdl: 2027/hvd.32044106386147. Retrieved 24 March 2013.